Hyundai has published the first official images of it new hydrogen fuel cell heavy duty truck to be unveiled in Germany next week. Due to go to market next year, the truck will take the starring role for the South Korean automaker at the IAA Commercial Vehicles 2018 to be held in Hanover. The truck follows on from Hyundai’s ix35 Fuel Cell compact SUV and the NEXO and boasts an entirely unique design language to set it apart from other Hyundai commercial vehicles. It also features an aerodynamic spoiler, a side protector and a front grille with hydrogen-inspired geometric shapes. 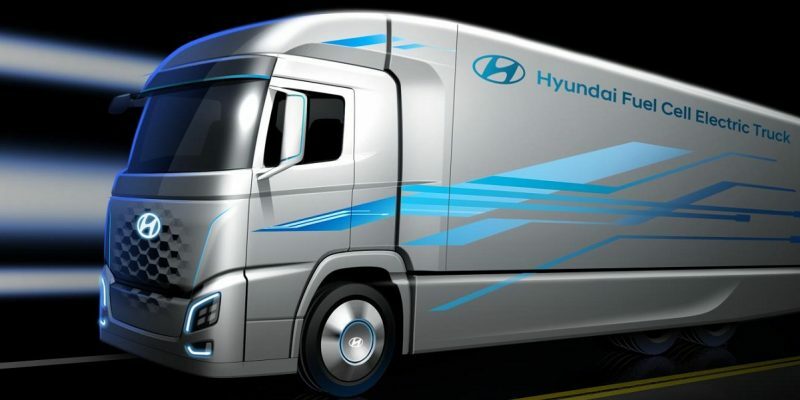 Hyundai will use the show to announce plans for introducing the fuel cell electric truck in the European eco-friendly commercial vehicle market as well revealing full vehicle specifications. The automaker recently completed South Korea’s first domestic highway journey with an autonomously navigated semi-trailer truck. Hyundai’s Xcient truck drove approximately 40km (24 miles) on the highway between Uiwang and Incheon, carrying large semi-trailer simulating cargo transportation.